Last week I was away, enjoying some much-needed family time, so you have my apologies for missing Tech Tip Tuesday. But, I'm back this week with a great tip for you! 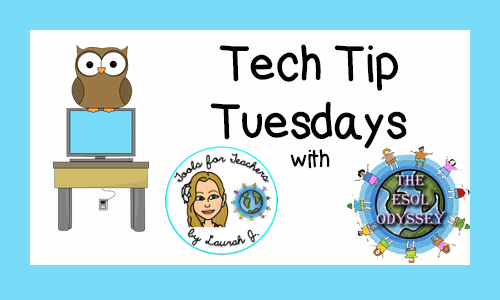 This week's tech tip is AMAZING and will change the way you run your classroom library. As an ESOL teacher, I always had a VAST classroom library of books at various levels for my students to choose from. Some were high-interest ones they couldn't find in the school library (Goosebumps, Graphic Novels, etc). I always have had a policy of letting students borrow my personal books for reading. In the past, that meant a spreadsheet, a sign-out/sign-in sheet, and hours spent on meticulous record keeping (how many copies of that book do am I supposed to have?!?). When I found Booksource Classroom Organizer, that all changed! Booksource is FREE and has a web interface and Android/iOS apps that work together to keep your classroom library organized, and so that you know who has checked out what at all times. You can even track student preferences by seeing what books they've checked out and how they rated them. You can upload your existing spreadsheet book inventory to your account, or you can use the apps to scan the barcode and add books that way. Add student groups or classes to your account by importing a spreadsheet as well. When it is time for students to check in/out books, you can either set up a station where students can check them in/out themselves via laptop or tablet, or you can do it quickly and easily yourself using the phone app. You'll also be able to select email settings that allow you to receive weekly reports via email about who has checked out which book. You'll be amazed at how this free system helps keep your classroom library running smoothly, without the hours of meticulous record keeping! Often time the school library has a limited number of books, and sometimes (depending on the district or school administration), none of the high-interest books our kids love to read. I believe that in order to get students to read, they have to want to read. Many of our ELL parents don't have time to take their kids to the library regularly. So, I think it is important to provide a way for our ELL kiddos to take home books other than the ones they can check out of the school library once a week. This website/app makes it easy to do.